The Ideal Choice When You Need to Melt Ice Quickly. Jiffy Melt® Ice Melt Salt Blend is the ideal choice when you need to melt ice quickly. The extreme cold of winter can cause ice to form dangerously fast. So you need an ice melt salt that works just as quickly. Jiffy Melt® Ice Melt Salt's specially formulated blend gets a fast start on melting ice in sub-zero temperatures to -10 °F / -23 °C. 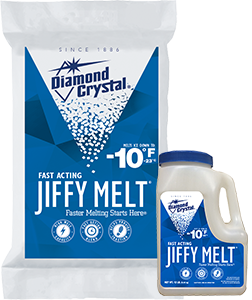 Jiffy Melt® Ice Melt Salt contains a specially formulated blend of Magnesium Chloride and Sodium Chloride for quick-melting action. At temperatures of -10 °F / -23 °C, Jiffy Melt® Ice Melt Salt Blend can melt more ice than straight Sodium Chloride, Potassium Chloride, Urea, CMA or a combination of these ingredients. At the same time, it costs less to achieve the coverage you want than pure Magnesium or Calcium Chlorides ice melt. Directions: Remove slush and as much loose snow as possible before ice melt application. Spread Jiffy Melt® Ice Melt Salt Blend evenly across surface area. Apply ½–1½ cups per square yard using scoop, push fertilizer spreader or salt spreader, depending on ice thickness and air temperature, as needed. Reapply as necessary. When ice and snow soften, remove slush and any excess ice melt from pavement for good concrete maintenance.